A mother is the truest friend we have, when trials heavy and sudden, fall upon us; when adversity takes the place of prosperity; when friends who rejoice with us in our sunshine desert us; when trouble thickens around us, still will she cling to us, and endeavor by her kind precepts and counsels to dissipate the clouds of darkness, and cause peace to return to our hearts. This past weekend, Americans all across the country celebrated mothers many different ways for Mother’s Day. Piggybacking on the idea Mother’s Day, and ways in which we honor moms, I found a quote that was awesome, and reflective of how we change and evolve over time –“Sooner or later we all quote our mothers.” Had you said something like this to me as a pre-teen, I would have scoffed at you and told you ‘nonsense.’ As a 30 year old, that is the ultimate compliment you could give me. It’s funny what 15-20 years can change, isn’t it? In looking for a blog topic this week, I found this great article, Your Mom Said WHAT? 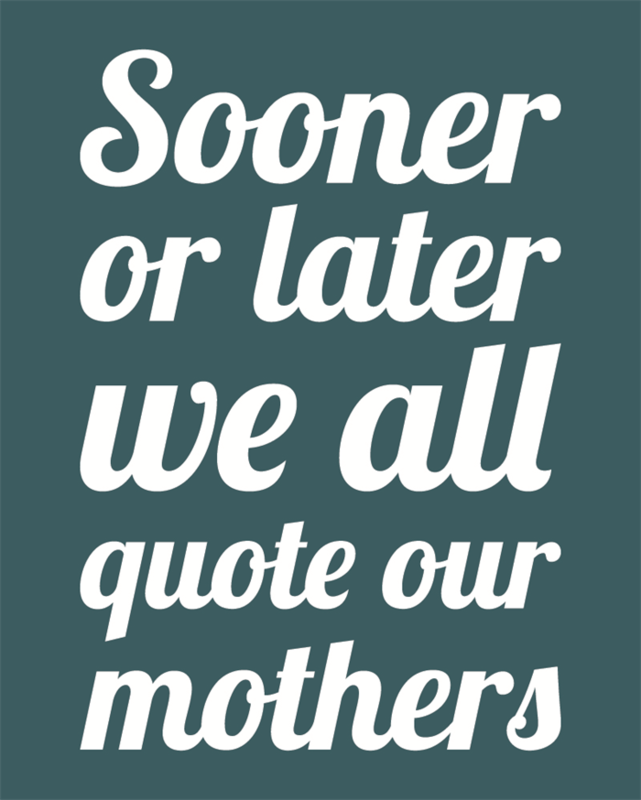 A Collection of Funny Momisms for Mother’s Day (I encourage you to check it out!). Immediately after reading this article it made me think of the many things my mom would say in situations that just stuck. I find myself doing something on the weekend and I remember a quote she used to say. I may be in a work meeting and the same is true. Something happens in a relationship or with a friend, and I can think of one of her quotes. These “sayings” we hear from our moms/mom figures as we grow up become road maps for us as we get older. Like sage words of wisdom or little nuggets of humor – just when we need them. I find myself in situations where I can absolutely imagine what my mom would say, or I just laugh because I think of something silly she said in situations and it’s like a little gift. In honor of showing thanks for our moms (whether by blood or those we have appointed as our mother figure), I’d like to encourage us to take some time to think of these quotes. I also encourage you to share them with others. What a marvelous way to honor moms. Although Jarvis was successful in founding Mother’s Day, she soon became resentful of the commercialization and was angry that companies would profit from the holiday. By the early 1920s, Hallmark and other companies started selling Mother’s Day cards. Jarvis became so embittered by what she saw as misinterpretation and exploitation that she protested and even tried to rescind Mother’s Day. The holiday that she had worked so hard for was supposed to be about sentiment, not about profit. Jarvis’ intention for the holiday had been for people to appreciate and honor mothers by writing a personal letter, by hand, expressing love and gratitude, rather than buying gifts and pre-made cards. This entry was posted in Character Development and tagged #grateful, #growingup, #igotitfrommymama, #JLLB, #momquotes, #mothersday, #theconfidencepost, #wisdom. Bookmark the permalink.